Can you imagine the terror that must have been in the heart of 11-year-old Dieter Uchtdorf as his family fled their home in East Germany1 in 1952 to find freedom in the West? For political reasons, the life of Dieter’s father was in extreme danger. He would have to escape alone to minimize risks to his wife and children. To avoid suspicion, the rest of the family would not be able to travel together. They would have to make the attempt separately. A plan was implemented. Dieter’s two older brothers, Wolfgang and Karl-Heinz, took a northern route out of their hometown of Zwickau. Their sister, Christel, traveled with two other girls on a train that passed briefly through West Germany en route to its destination city in East Germany. As the train passed through West Germany, the girls persuaded the conductor to open the door for them, and they jumped out of the train. Dieter, age 11﻿—the youngest of the children﻿—and his courageous mother took still another route. They carried with them only a little food and precious family photographs that had been preserved from destruction through World War II. After Dieter and his mother had walked long hours, Sister Uchtdorf’s knees began to weaken. Dieter carried their belongings and helped his mother climb a final hill to freedom. There they stopped to eat a meager meal, only to realize, when they saw Russian guards, that they were still shy of the border. The mother and son terminated their picnic, picked up their packs, and climbed even higher before reaching their goal. Dieter and his mother continued their trek as refugees, hitchhiking and walking to their destination at a suburb near Frankfurt. After many long and perilous days of separation, the family was finally reunited. The brothers arrived first; their father followed. Dieter and his mother then arrived, and his sister came last. Their great reunion was joyful. Of lesser significance was the fact that they had left behind virtually all of their possessions. Seven years earlier, toward the close of World War II, they had fled from home as foreign forces approached. Now they were refugees again. Once more they owned nothing. Once more they had to start over. But they had each other. They had their deep faith in God, and they had their membership in The Church of Jesus Christ of Latter-day Saints, acquired barely five years earlier. The family’s one-room apartment near Frankfurt was small and infested with mice. Young Dieter was intrigued by the rodents running around. Public transportation in Frankfurt was relatively inexpensive, but the family could not afford for all to travel to church each week. So they took turns. It is no wonder that President Uchtdorf feels so passionately about the sacred institution of the family. With great sincerity he testifies that the family is ordained of God. Family is of utmost importance to him. It was within his family that the seeds of his powerful faith were sown and nurtured. There he began to prepare for the fulfillment of his foreordination as a priesthood leader in the Church of God. Dieter Friedrich Uchtdorf was born of goodly parents, Karl Albert and Hildegard Else Opelt Uchtdorf, on November 6, 1940, in Mährisch-Ostrau, Czechoslovakia. The family left Czechoslovakia in 1944 and moved to Zwickau, Germany. From 1949 to 1990, Zwickau belonged to East Germany and was a center for the mining of coal. Because of its strategic importance during World War II, it became a prime target for Allied bombers. Four-year-old Dieter was frightened but also fascinated by the lights of aircraft as they flew overhead. He remembers his mother taking him to air-raid shelters for safety. Her husband had been drafted into the German army, and Sister Uchtdorf bravely fended for her family as the war in Europe swirled about them. After the war, Dieter’s father worked in coal and uranium mines in Zwickau under environmental conditions that predisposed him to the development of a malignant disease that claimed his life at age 62, in Germany. President Uchtdorf remembers his father as kind and loving, strong and tender. His father cherished his priesthood responsibilities as a deacon, teacher, priest, and elder. His mother, Hildegard, who died in 1991, was not only courageous, but she was also a true convert and devoted disciple who served in many callings in the Church. These parents and their children were sealed in the Swiss Temple in 1956. Since then, his brothers, Wolfgang and Karl-Heinz, have passed away. His sister, Christel Uchtdorf Ash, who served a mission in Germany, presently resides in Texas, in the southern United States. President Uchtdorf met his future wife, Harriet Reich, as they attended meetings of the Church’s Mutual Improvement Association. Harriet was baptized when she was nearly 13 years of age, along with her mother and her sister, after missionaries knocked on their door and taught them the gospel. Harriet’s father had died from cancer just eight months earlier. Her mother and her sister have since passed away. A remarkable reward came to one of those missionaries, Elder Gary Jenkins, who had taught and baptized the Reich family. What a joyful day it was for him, decades later, when on February 16, 2008, his granddaughter, Crystal, was sealed to her husband, Steven, in the Salt Lake Temple by a member of the First Presidency, President Dieter F. Uchtdorf. The Uchtdorfs are the parents of two children. Their daughter, Antje, is married to David A. Evans. Antje and David have three sons: 19-year-old twins, Daniel and Patrick, and 8-year-old Eric. They live in Darmstadt, Germany. The Uchtdorfs’ son, Guido, served in the Washington D.C. South Mission. He married Carolyn Waldner from Basel, Switzerland. Guido and Carolyn now live near Zürich, Switzerland, where Guido serves as bishop of the Wetzikon Ward of the St. Gallen Switzerland Stake. They are parents of three children: Jasmin, age seven; Robin, age five; and Niklas Ivan, age one. Guido and Antje learned from their parents the importance of time together as a family. Whether an outing was educational or recreational, it helped strengthen family ties. Parenting and grandparenting at a distance are now facilitated for the Uchtdorf family by the use of modern technology. E-mail and telephone calls are augmented by the transmission of movie clips and photographs via the Internet. But time together is valued. Especially meaningful for Guido was being able to attend the April 2008 general conference and to be present as his father stood at the Conference Center pulpit. On the occasion of President and Sister Uchtdorf’s 40th wedding anniversary, they gathered at the Bern Switzerland Temple with their children, spouses, and older grandchildren to perform sacred ordinances together. That temple is dear to Harriet and Dieter because their parents, they, and their children were all sealed there. One cannot study the life of this great man without gaining a sense of his unique and unshakable faith. He has total faith in God, faith in the Lord Jesus Christ, faith in the Church, and faith that heavenly help will come to him when needed. His parents risked their lives for their freedom and faith. His father honored the priesthood that had been entrusted to him. He learned from his mother﻿—particularly during their risky escape from East Germany﻿—to pray and to trust in the Lord. President Uchtdorf has special feelings of fondness for the late Elder Theodore M. Burton (1907–89), who served as president of the West German Mission. At a time when many good German Latter-day Saints were leaving their homeland, the Uchtdorf family heeded Elder Burton’s counsel to stay in Germany and build up the Church there. It was Elder Burton who ordained Dieter F. Uchtdorf to the office of elder and gave memorable instruction that Dieter heeded precisely. Sister Harriet Uchtdorf understood the importance of Elder Burton’s counsel for the Uchtdorf family to remain in Europe to strengthen the Church there. It became an imperative for them. Their children have adhered to that same counsel. Now, in jest, the children chide their parents for leaving for the United States, while they have remained in Europe. Of course, Elder Burton was not the only leader who had a great influence on President Uchtdorf. Dieter remembers his branch president at the time Dieter was set apart as president of the deacons quorum. The branch president gave thorough instruction regarding the duties and responsibilities of a new quorum president. Dieter remembers the significance of that teaching, which a lesser leader might have slighted simply because there was only one other member of the deacons quorum. The faith of this family is personified by the faith of President Uchtdorf’s grandmother. She was standing in line for food following the end of World War II when an elderly single sister with no family of her own invited her to sacrament meeting. His grandmother and his parents accepted the invitation. They went to church, felt the Spirit, were uplifted by the kindness of the members, and were edified by the hymns of the Restoration.3 In 1947 Dieter’s parents were baptized in Zwickau; Dieter was baptized nearly two years later at the age of eight. The family’s commitment to the Church became strong and enduring. His foundation of faith undergirded confidence in his own ability to achieve. His career started with an education in engineering, followed by six years in the German Air Force. Then, thanks to a reciprocal relationship between the German and U.S. governments, he entered pilot training school in Big Spring, Texas, where he won wings with both the German and the American Air Forces. He won the coveted Commander’s Trophy for being the outstanding student pilot in his class. In 1970, at age 29, Dieter F. Uchtdorf achieved the rank of captain with Lufthansa Airlines. Ultimately he became chief pilot and senior vice president of flight operations for Lufthansa. In 2004, prior to his call to the Quorum of the Twelve, and quite by coincidence, Elder Uchtdorf and I traveled together on a Lufthansa flight to Europe. It is not unusual for airline passengers to recognize and greet General Authorities traveling on the same plane. But this time the greetings were quite different. Virtually every member of the Lufthansa crew came eagerly to greet their former chief pilot. They lined up for the privilege of shaking his hand. Their feelings of deserved adoration for him were very evident to me. They seemed to perceive his great faith as well as his caring for them. President Joseph F. Smith (1838–1918) revealed that leaders (such as President Uchtdorf) “were also among the noble and great ones who were chosen in the beginning to be rulers in the Church of God. Wouldn’t it be nice if it were possible to ask President Uchtdorf’s mother if she had any inkling that her youngest son might be called one day to serve in the First Presidency of the Church? What did she sense as she nurtured her young son, enabled his freedom, and saved his life? On one occasion she and the children were in a public auditorium. She was impressed to leave the building immediately. Because of that urgent feeling, she availed herself of a wheeled cart, placed young Dieter in it, and scurried away with her children as quickly as possible. Shortly thereafter, the building was destroyed by an act of war. Most occupants of the auditorium were killed. Sister Uchtdorf and her children were spared. As a child growing up after World War II, President Uchtdorf remembers playing in bombed-out houses and discovering guns, ammunition, and other weapons deserted in the nearby forest. Through the years, he has lived with the ever-present consequences of war and the awareness that his own country had inflicted terrible pain on others. In fact, he and his family were also victims of an oppressive dictatorship. The mathematical probability of this Czechoslovakian-born child of a convert family surviving such a risk-laden life and then being called to serve in the First Presidency is most unlikely. But the Lord has known and loved this special man from before the world was formed. Yes, he has been foreordained for his duties as a leader in The Church of Jesus Christ of Latter-day Saints. Now he stands beside President Thomas S. Monson in his sacred calling. President Henry B. Eyring and President Dieter F. Uchtdorf are great servants of the Lord, willing and able to provide counsel to the President of the Church. These three presiding high priests complement each other. Members of the Church will gladly and gratefully follow their inspired leadership. Officially designated as the German Democratic Republic. See Malachi 3:10; 3 Nephi 24:10. 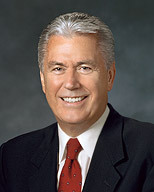 See Dieter F. Uchtdorf, “The Opportunity to Testify,” Liahona and Ensign, Nov. 2004, 74. Mosiah 3:20; see also Revelation 14:6; 1 Nephi 19:17; 2 Nephi 26:13; Mosiah 15:28; 16:1; Alma 37:4; D&C 133:37. See Jeffrey R. Holland, “Elder Dieter F. Uchtdorf: On to New Horizons,” Liahona and Ensign, Mar. 2005, 13; Ensign, Mar. 2005, 15. Left, from top: President Uchtdorf’s parents, Hildegard and Karl, at the Bern Switzerland Temple. At age 12. At age 2 (second from right) with his sister, Christel (right), and two friends. Right, from top: Dieter (right) with friends in front of the Frankfurt meetinghouse. At a young single adult meeting (back row, far left); Harriet, his future wife, is in the front, second from left. With a friend’s car in Frankfurt. Opposite page: Following six years in the German Air Force, Dieter earned his wings with the U.S. Air Force and received the Commander’s Trophy award. Above: Even though his job as a pilot required long absences from home, both of his children (pictured with their parents) remember that their father always made spending time together a priority. Prior to his call to the First Quorum of the Seventy in 1996, President Uchtdorf worked for Lufthansa Airlines. Opposite page: The Uchtdorf family in 2006. Standing, from left: Patrick Evans (grandson), Harriet, Dieter, and Daniel Evans (grandson). Seated: David Evans (son-in-law), Antje Evans (daughter), Eric Evans (grandson), Robin Uchtdorf (grandson), Carolyn Uchtdorf (daughter-in-law), Guido Uchtdorf (son), and Jasmin Uchtdorf (granddaughter). President and Sister Uchtdorf’s youngest grandson, Niklas Ivan Uchtdorf, was born in 2007. Opposite page: President Uchtdorf and Elder David A. Bednar were both called to the Quorum of the Twelve Apostles in October 2004. Above: The new First Presidency was announced at a press conference in Salt Lake City on February 4, 2008.